It's not every day you get to chat to Nollsie, but this morning, Claire & Sam did just that when he joined the show to chat about his show, Live On The Lachlan on April 13th and the amazing cause behind it! He's thrown his full support behind Deyan Cashmere, a 20-year-old from Hillston who was diagnosed with Acute Lymphoblastic Leukaemia on March 11 last year. Deyan has been undergoing treatment in St Vincent's Hospital in Sydney for the past 12 months and unfortunately, has relapsed and his only hope of survival is T-Cell (CAR T-Cell) treatment in the US, at a cost of $US400,000. His doctors said he must have the treatment within the next month in Washington if he has any hope of beating the disease. Since we're all about helping out our mates, Live On The Lachlan was born to help raise money for Deyan's treatment. 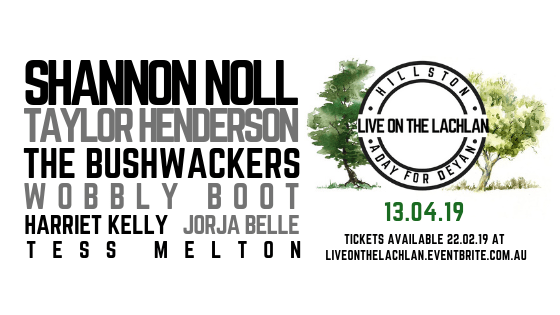 Early bird tickets are on sale now, and you can get yours by heading to www.liveonthelachlan.eventbrite.com.au and we'll see you there on April 13!